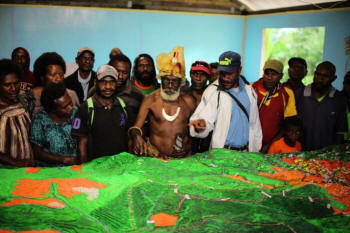 1:5000 scale Participatory 3D Model (P3DM) of the of the Watabung Local Level Government (LLG) in Daulo District, Eastern Highlands Province (EHP), Papua New Guinea. The model has been manufactured by local communities in May 2014 for planning for disaster preparedness and managing the Ona Keto Reforestation Project. 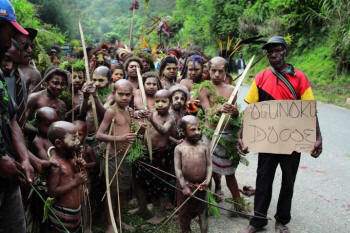 The model measuring 4.8 m x 2.4 (288 km2 on the ground) is the 5th Participatory 3D Model constructed in PNG. The exercise has been organised and facilitated by the NGO Partners with Melanesians (PwM) and the Ona Keto Peoples Foundation Inc. with support provided by The Nature Conservancy (TNC) Australia, and AusAID.